Now that you are looking at treatment options, it is important to learn everything you can about your condition and how to treat it. Ask any survivor – it is crucial to surround yourself with those who support you. And you benefit from taking an active roll, not only in understanding your condition, but in working with your health care providers as they guide you on your healing journey. Surgery is normally part of breast cancer treatment. Lumpectomy involves removal of a portion of the breast where cancer is located. Mastectomy is the surgical removal of the entire breast. Adjuvant, or additional, treatment is often used as well to prevent growth, spreading, or recurrence of cancer. Chemotherapy, radiation therapy, and drug treatments are types of adjuvant therapy. Chemotherapy is treatment with anticancer drugs. It is administered intravenously or orally with pills or liquid. It works to destroy the production of cancer cells throughout the entire body. Radiation therapy uses high-energy rays to stop breast cancer cells from growing and dividing. Other drugs can also be used depending on the type and stage of breast cancer, including herceptin and tamoxifen. With so many treatment options, how do I choose? You don’t have to make this decision alone. You, your providers, and your family will discuss treatment options and come up with a treatment plan that works for your specific situation. This will include the type and stage of breast cancer you have, your overall medical condition, and your lifestyle. Your treatment plan may need to be adjusted from time to time, but you will always have professionals to guide you. Different treatments have different side effects. Breast surgery may cause swelling, tenderness, and sometimes seroma or hematoma (blood or clear fluid trapped in the wound). Radiation can cause soreness, swelling, and reddening at the site of treatment, or fatigue and loss of appetite. Chemotherapy can cause nausea and vomiting, hair loss, and fatigue. Skin problems, anemia, infections, and fluid retention can also occur. Side effects of treatment vary from one person to the next and generally they go away after treatment has ended or wounds have healed. I don’t have health insurance. How will I pay for my treatment? There are several government and nonprofit organizations that help pay for treatment. If you were screened and diagnosed with breast cancer through the National Breast and Cervical Cancer Early Detection program, you may be eligible for a special type of Medicaid that will pay for your treatment. Call 1-800-478-4372 for more information. The Alaska Cancer Society provides assistance connecting you with insurance that will cover your treatment. It also provides assistance with travel and lodging. Call the Anchorage office at 1-907-277-9696 for more information. The Affordable Care Act, or health care reform, has opened more opportunities and access to affordable health insurance. Visit healthcare.gov or getcoveredalaska.org for more information. 1. Surgery: removes the cancer. This may involve conization (removing a cone-shaped piece of tissue), hysterectomy (removing the uterus and cervix), and/or removing other tissues. You may be eligible to participate new treatments offered via clinical trials. 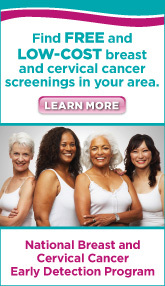 Many women choose to employ a variety of techniques in the fight against cervical cancer. Your options include alternative medicine, which is often used in place of standard techniques, and complementary medicine, which can be used as a complement to standard techniques. Healthy lifestyle changes such as increased vitamin uptake, meditation and yoga can also be helpful.